Our customers love it and our cleaning teams won't live without it. You'll be hooked too. 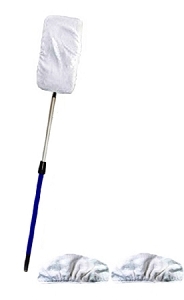 The Sh Mop starts with a sturdy, extra-big, 8" x 15" plastic base called, what else, a Sh-Base. 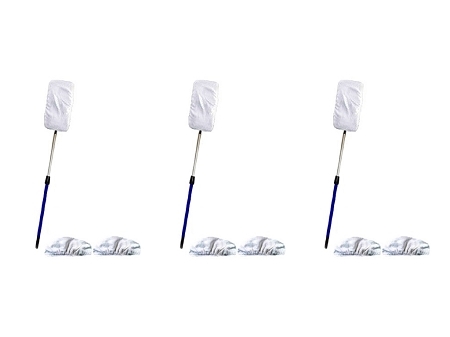 Unlike ordinary mops, the Sh-Base has a very low profile and pivots in any direction to allow you to quickly and easily clean into corners, along tough angles, and underneath tight spots. It's covered with a replaceable 8" x 15" grey foam pad. Then, a thick, 100% cotton terry cloth cover (called a Sh-Wipe, of course) slips over this frame. The scrubbing and absorbing properties of reusable cotton Sh-Wipes make short work of dirty floors. When one Sh-Wipe gets soiled, just pop it off and pop on a fresh one. Ideal for virtually any hard floor: vinyl, urethane-finished wood, tile, marble. Use it on walls, windows, ceilings and cabinets. 93 PERCS will be rewarded to you when you buy this item.